Destination: Murchison, Bwindi Impenetrable Forest, Kibale Forest, Queen Elizabeth National Park, Mgahinga Gorilla National Park, Volcanoes National Park, Lake Mburo, Lake Bunyonyi and Ngamba Chimpanzee Sanctuary Island. 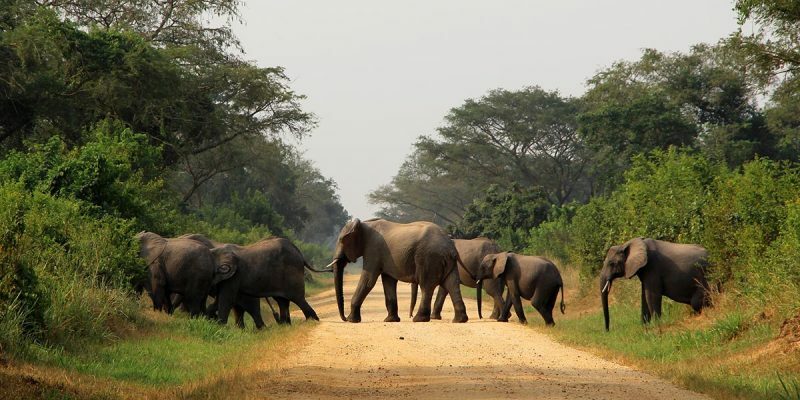 During the 16 Days Uganda Wildlife Safari Holiday adventure you will experience all that Uganda has to offer. From the famous Murchison Falls and chimpanzees in Kibale National Forest, to the mountain gorillas in Bwindi Impenetrable forest, this adventure gives you to the best of Uganda in just 16 days! Transfer to Murchison Falls National Park. Early morning our gorilla safaris Uganda staff will pick you from the hotel or guesthouse of your choice and take you to Murchison Falls National Park. We will stop for lunch in Masindi and then drive for 90 kms through the park, aiming for Paraa. On the way we will visit the Top of the Falls, with a wonderful view over Murchison Falls and the Nile. We will reach Paraa late in the afternoon, and Luxury Tour participants will cross the Nile by ferry to reach Paraa Safari Lodge. For Budget Tour clients, we’ll stop at Ziwa Rhinos Sanctuary for tracking the Rhinos and also have Lunch here before continuing via Karuma Bridge to reach later in the afternoon at Fort Murchison just outside the park boundaries.”” The day will close with a cool drink and a fabulous view over the river Nile, and the evening coming with all the noise of an African night. Wildlife Safari in Murchison Falls National Park. The day will be spent viewing game around the park and along the Nile. We will leave early in the morning (if staying at Nile Safari Lodge or Red Chilli Paraa we will cross the Nile with the ferry at 7.00am) and go on a game drive from 8.00am to 12.00noon, seeing several animals including lions and giraffes. In the afternoon (2.00pm to 5.00 pm) we will go on the impressive launch trip on the Nile, up to the Falls, giving you a chance to see hippos, crocodiles, buffaloes, elephants and many many different birds! Early in the morning the boat will take us downstream to the Delta, where the Nile enters Lake Albert. This trip of 5-6 hours will show us all the beauty of this national park especially the delta with all the different birds. This is a good chance to seethe elusive Shoebill Stork! In the afternoon you can relax, and if you are on the Luxury Tour you can swim at your respective Lodges. Transfer to Kibale Forest National Park. Early in the morning we will leave for Kibale Forest. We will pass close to Lake Albert: on a clear day the view from the top of the Albert rift is spectacular. In the afternoon we will arrive at Kibale Forest Camp, where we will stay sleeping with the noises of the tropical rain forest. Sometimes we stay at Chimpanzee Guesthouse, overlooking Nyabikere Crater Lake, where we will stay. The lake is famous for the frogs: at night they always give a beautiful concert. At 8.00am we will start with the 4 hour chimp walk – during which you may also get to see 10 other primates! Kibale park is also known for all the butterflies and birds. In the afternoon we will walk through Bigodi Swamp (home to a community based project). Transfer to Queen Elizabeth National Park. Early morning we will leave for Queen Elizabeth NP. We will travel through Fort Portal and reach Mweya in Queen Elizabeth NP at midday, with a stunningly beautiful view over Kazinga Channel. You will check in at your accommodation and have lunch, and in the late afternoon (4.00-7.00pm) we will go on a game drive. This day is for a game drive on the plains of Queen Elizabeth NP, with thousands of Ugandan kobs, lions, elephants etc. Also on the programme is a two hours launch trip on the Kazinga channel where we will see all the animals from the waterside. Our second day in this beautiful park. Very early in the morning after breakfast we will go to Kyambura Gorge. Here people can go for a 3-4 hour walk into the Gorge to meet the chimpanzees. After Lunch at Jacana Safari Lodge, we will drive for 2 hours to the Southern sector of Queen Elizabeth called Ishasha Sector, famous for its tree climbing lions. Game drive in the afternoon to search for the tree climbing lions. In the morning we will go on a game drive looking for the unique tree climbing lions in the Ishasha sector of Queen Elizabeth National Park, and in the afternoon we will continue to Bwindi. On the trip we will pass Kihihi and journey through mountains, hills and lakes with cultivated terraces and tropical rain forests. Buhoma is only 5 minutes’ walk from the offices of Bwindi Impenetrable Forest National Park, where at 7.45am you will receive a pre-briefing and at 8.30am you will start the gorilla trek. Once you have found the mountain gorillas, you will be able to spend up to one hour with them! You will be expected back to the starting point by 7.00pm at the latest. Early in the morning we will leave for Kisoro, travelling through a beautiful landscape also defined as the “Switzerland of Africa”: mountains, lakes, hills with cultivated terraces, tropical rain forest and bamboo forest. On the last hill the landscape unfolds beneath us, taking in the vast planes between Uganda, Rwanda and Congo, with the Virunga volcanoes dominating the view. At the bottom of the valley is Kisoro, where we will stay at the famous Travellers Rest Hotel. with Travellers Rest Hotel as the home base. Gorilla tracking in Nkuringo, South Bwindi (1 day – this could be either day 13 or 14, depending on the availability of permits). Gorilla tracking in Rwanda (requires staying in Rwanda the night before, so for example if you decide to trek gorillas in Rwanda on day 14 you will spend the night of day 13 there). After the trekking you will cross back to Kisoro. Batwa Trail: It starts at the base of Mt Muhavura at 8.00 am and finishes by 3-4 pm. You’ll need walking shoes, hat, and raingear, and a packed lunch with sufficient drinks. The Batwa Trail runs across the lower slopes of the Muhavura and Gahinga volcanoes in Mgahinga Gorilla National Park. The forest is home to a variety of wildlife but the Batwa Trail is far from being a conventional nature walk. With the help of Batwa guides, you’ll see the forest as a larder, pharmacy, builder’s yard, tool kit and, above all a home. Along the trail, you’ll fire a bow and arrow, check hives for wild honey, help repair a Batwa shelter, harvest plants for medicine and food, light a fire without a matches, listen to legends and learn about Batwa traditions. The highlight of the trail is a descent into the Garama cave, a 200m-long lava tube beneath Mt. gahinga. The Batwa are famed for their music and dance and their historic, subterranean council chamber in Garama Cave provides the setting for an unforgettable performance. Luxury Tour: Travellers Rest Hotel Kisoro (Suite Room). To Lake Mburo National Park for wildlife game safari. Early in the morning we will leave for Lake Mburo National Park. You will have lunch in Mbarara before you continue to Lake Mburo, a smaller but unique park, and the only one in the Western part of Uganda with impalas and zebras. In the park we will go on an evening game-viewing drive. First thing in the morning we will go for a game drive/walk, and after a late breakfast the last part of the journey will bring us back to Kampala. On the way back you will have lunch in Mbarara town, and after Masaka there will be an opportunity to a stop at the Equator for photo shoots and buying souvenirs and have tea or coffee.